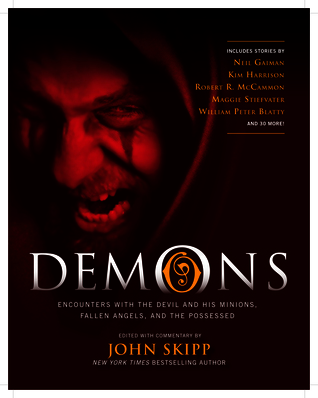 Splatterpunk lord John Skipp has compiled a nicely-balanced collection of vintage tales, contemporary classics, and a slew of brand-new stories involving demons and the demonized. Lots of recognizble names in here, but kudos to Skipp for assembling many first-rate tales from up-and-coming authors (several of whom--Laura Lee Bahr, J. David Osbourne, and James Steele, for example--are writers I've encountered for the first time, and am looking forward to reading again).A superb offering of both quantity and quality. The Bespelled - The Hollows, 6.14 starsThis is the story of how Ceri came to be Al's familiar.The knowledge of who owed him and what was worth a lot in the demon's world, and familiars were known for their loose tongues until you cut them out. It was a practice Algaliarept frowned upon. Most of his brethren were bloody plebeians. Removing a familiar's tongue completely ruined the nuances of their pleas for mercy.AL, ladies and gentleman.But appreciation for the finer nuances of pleading aside, Al is bored. Bored and tired. Life has become a drudgery, and he's even contemplating taking a vacation, removing his name from the human world so he can no longer be summoned. Until Ceri summons him, that is.But butterflies like carrion as much as flowers, battlefields as much as gardens.And Ceri prefers the battlefield.This is one of the shorter stories in this book, but it's one of my favorites. READ IT. I'm pretty sure it's included in the back of one of the paperbacks, b/c I've read it before. Darkeva was charitable enough to ship me a copy of this impressive--and weighty--anthology. It's damn-near a tome in trade paperback form. In a sense, it feels appropriate for a book about demons and spectres, things that haunt and oppress, should have some gravity to it. Like a monkey on your back. Oddly enough, that's almost exactly the kind of demon this book starts off with, in the first story, Adam-Troy Castro's "Cherub," about a world in which each persons inner demons reside squarely on their shoulders.John Skipp has found a near perfect balance of humor and horror with an ensemble of stories from acclaimed authors of the past and today's up-and-comers, a few icons in between. It's pretty hard to find fault with an anthology that not only captures a theme so completely, but provides such a rich variety of stories that shine a light on the idea of demons and the evil inside us all.There are over thirty stories in this book, closer to forty if I went back to count. Some are brief aperitifs with snapshots of the devilish, and a couple weigh in closer to novella length. A couple are excerpts from iconic novels like that of The Exorcist by William Peter Blatty, and if you're going to throw in a snippet from a novel about demons, you may as well as go with the most infamous novel in the world on the subject.For me I had as much fun reading the blasts from the past, like Charles Beaumont's "The Howling Man" and W.W. Jacobs' "The Monkey's Paw", as I did reading stories by authors whose work I'd yet to sample, like Maggie Stiefvater's "Non Quis, Sed Quis" and Livia Lliewellyn's "And Love Shall Have No Dominion." The book starts things rolling with quite a few classic demonic tales, which act as a prelude to what the more modern authors have to offer.One of my favorites is Robert McCammon's "Best Friends," which is a roaring novella that veers into crazytown quickly and only gets crazier as it goes. I mean, it's one thing to feel trapped on a hospital floor with the insane, but it's quite another to wind up like one of them when one patient's delusions come true. I always hear McCammon's name bandied about when it comes to recommendations, so it looks like I need to make one of his books a priority to read this year. Another fave is Weston Ochse's "20th-Level Chaotic Evil Rogue Seeks Whole Wide World to Conquer." That one was just an acerbic treat to read with a protagonist that was utterly disdainful, but ultimately I could still root for the guy--just a little. Alethea Kontis' "The Unicorn Hunter" was a stand-out with its tinges of fairytale elements amid a book full of grotesqueries, though a story involving the hunting and slaughtering of unicorns wasn't without its own share of bloodshed. The ending of that one offered a bit more wistful reaction than the others though, and was a welcome change of pace.I could go on and on but different stories in this book, but I'll simply wrap this up by saying this is a delicious anthology that should be one every demon-lover's bookshelf. John Skipp also has a couple other anthologies through Black Dog & Levinthal about Werewolves and Zombies, so I'll have to make it a point to see how perfectly he encapsulates those monsters. THE story BESPELLED BY KIM HARRISON IS IN THIS BOOK, WITH MANY OTHERS ABOUT 35 STORIES IN FACT STILL READING AND VERY GOODBESPELLED, BEFORE RACHEL SAVES THE CHARACTER IN THIS STORY THE ROYAL ELF HAS BEEN CALLING UP THE DEMON ALGALIAREP FOR YEARS, SHE IS TO GET MARRIED AND END HER STUDIES WITH HIM BUT HE HAS CHARMED HER AND THRU LIES IS ABLE TO STEAL HER FOR OVER A THOUSAND YEARS, BEFORE RACHEL RESCUES HER BEING RACHEL MORGAN IN THE HOLLOWS SERIES IS IN THE SAME POSITION. TO BE OWNED AND USED BY THIS DEMON TO DEATH. I DO WISH KIM WOULD WRITE A FULL LEGTH STORY ON THIS STORY SPANNING OVER THE 1000 YEARS OF SERVICE TO ALGALIAREPT, WONDERFUL STORY, IT WAS GREAT TO SEE HOW CHERI WAS STOLEN THRU LIES AND DECEIT MAINLY CHARM FROM A LIAR DEMON. SO MANY MORE STORIES TO READ IN THIS BOOK..THIS IS A ''''LARGE'''' BOOK WITH MANY STORIES MANY SHORT STORIES FROM OTHER BOOKS AND ITS GREAT, SCARY GOOD. WHAT I LIKED IT SOME OF THESE SHORT STORIES FILLED IN THE BLANK STORYLINE FROM OTHER BOOKS LIKE The very first book I mentioned. a book by Kim Harrison I wanted the info on that character so bad and a friend found this short story that gave me that info. All these stories are great. REVIEWED: DEMONSEDITED BY: John SkippPUBLISHED: September, 2011L-O-V-E-D this anthology! IMMENSE collection of both classic literary tales and wild new fiction exploring the lore of Demons in culture. Violent, Funny, Provocative, this collection really has something for everybody. Of course, with so many stories and ideas, not all of them hit the mark, although that may be perceived as a matter of taste. I had read all the classics previously, but was nice to see them intermixed with the new fiction - including, "The Monkey's Paw," by W.W. Jacobs, "The Black Cat," by Edgar Allen Poe, and "The Howling Man," by Charles Beaumont. Some of my favorite new fiction included "Cherub," by Adam-Troy Castro, "Consuela Hates a Vacuum," by Cody Goodfellow, "Best Friends," by Robert R. McCammon, "Stupid Reason to Sell Your Soul," by Carlton Mellick III, and "Other People," by Neil Gaimon. My absolute favorite was "Mom" by Bentley Little! With 37 stories plus articles, this collection is a complete sampler of the theme of "Demons." This is one fat book of Satan stories from veteran editor John Skipp, heavy enough to bulge a vertebrae or two. It's the sheer variety that's the biggest draw, from classic tales like The Monkeys Paw to new fiction by Bentley Little, there's a little something for everyone in Demons. One dark and stormy night I watched Álex de la Iglesia's 2006 film, The Baby's Room, after reading a few of the scarier pieces in Demons, and the combination was harrowing enough to make my skin crawl. A mandatory anthology for the helplessly hellbound. Really enjoyed this short story (I only read The Bespelled) and yeah, it was awesome to be in Al's POV for the first time (there's another one, set after The Witch With No Name) and how the whole thing with Ceri started! Can't wait to read more short stories that I hadn't! By far one of the best anthologies I've ever read. Practically every story was a winner. Well done. Lots of good stories here, my definite favourite being Pilgrims at the Cathedral. It is long, however, and after a while I did start to get a bit bored, but that's the beauty of anthologies. You can pick them up, put them down, pick them up again and start reading from a different place. It does not matter. Nice range of both older and newer authors. Work reading: a mixed collection but much of the older material is really great. I had read this one before as it is in the back of the paperback of The Outlaw Demon Wails. I liked that with this one we learned more about Al and Ceri and how they came to be together. Part of me felt sorry for Ceri, but another part of me thinks she got what she deserved with her actions. With hindsight, knowing what happens to them, all I'm left feeling is melancholy for them both. Well written horror stories with not a single bad short story. The best, according to me were The Howling Man, And Love Shall Have No Dominion, 20th Level Chaotic Rogue, The Unicorn Hunter and Other People. Although I got this collection for the Kim Harrison story I found myself not impressed with the capture of Cersi, however the insight into Al was much welcomed. I only read about a third of the stories in this 600+ page anthology before I had to return it to the library, so I won't rate it. But it's DEFINITELY worth checking out, if only for the first and last of the short stories within. Creepy! I loved the mixture of new stories from contemporary authors and classics from the likes of Poe. I'll probably put myself back on the reserve list for it. The individual books in here are wonderful, the flow and juxtaposition of them are wonderful, but I'm not a horror reader and it was just too big for me to really enjoy.That said, the excerpt from the Exorcist was horrifying, and I think I may be haunted by Amelia Beamer's Staying the Night forever. Seriously. That is shudderworthy.If you do like horror I'd thoroughly recommend it. Some very good short stories. definitely worth your time. I hit the last third of this and gave up...some stories were creepy, some were EXCELLENT, and some were blah. I just can't get back into it after putting it down a couple of weeks ago. Most of the stories were wonderful, only 2-3 didn't catch my fancy. Entertaining and packed full of different authors to keep you busy for awhile.